If you love the fashions of the jazz age, Art Deco style jewelry is a great way to incorporate vintage beauty into your modern wardrobe. These styles, which features the repeating geometric motifs and sleek glamour of the 1920s and 1930s, work just as well for contemporary women as they did for the flapper girls of the past century. 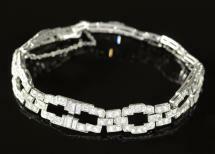 Understanding what makes a piece Art Deco can help you build a great jewelry wardrobe from this era. Whether you're purchasing antique pieces or collecting modern reproductions, you'll find that most items from the 1920s and 1930s include some or all of the following characteristics. Although yellow metals also made an appearance during the Art Deco era, the majority of these pieces are made of cool-toned metals or imitations of them. This lends Deco pieces a sleek, modern appearance and a sophistication that calls up the 1920s. Another element of the majority of Art Deco jewelry designs is filigree work. Filigree involves delicate openwork designs that sometimes suggest lace, and it was very popular during the 1920s and 1930s. Commonly, these lacy designs feature flowers, leaves, or swirls, but they sometimes echo the overall shapes and lines of the central gemstone. Geometric designs are also a defining feature of the Art Deco look. Sometimes a variety of geometric shapes are used together to create a complex piece with interesting lines. Often, these shapes have straight lines and angles, although curves are sometimes part of the design. You'll also see perfect symmetry in many pieces. 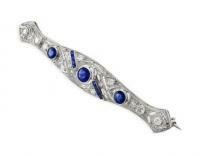 Many examples of Art Deco-style jewelry have enameled elements. Enamel involves fusing molten colored glass to metal, and it's a great way to add color or contrast to a piece. In the Deco era, many jewelry items featured black, blue, green, or deep red enamel, but you can find pieces in almost any color. 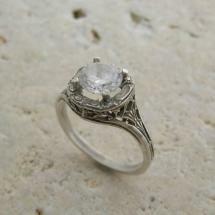 It's popular on fine jewelry, as well as costume pieces. Although diamonds and clear imitation diamonds were hugely popular during the 1920s and 1930s, many Deco-style pieces also have colored or opaque gemstones. In costume jewelry, these 'stones' may be paste, glass, or high quality imitations. 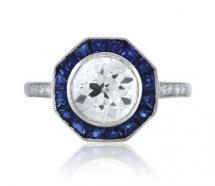 You'll find pieces that have colored stones as the central focus, as well as items with colored or opaque accents. In contrast to the sleek, geometric shapes of the Deco period, many authentic and reproduction pieces also include some elements that swing or move with the wearer. 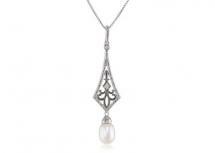 Hanging pendants and drop earrings are popular in both fine jewelry and costume examples. 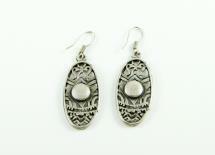 Many brooches and pins also have a teardrop bead or hanging piece that swings from the main portion of the design. You'll also see long, layered strands of pearls or beads that have lots of dangly movement. Most Art Deco-style pieces have more than one element of period design. 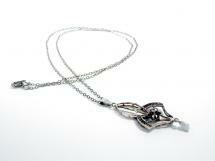 To really represent this era, a great piece of jewelry will feature two or three typical Art Deco elements. Because of its classic beauty and gorgeous design elements, Art Deco-style jewelry is timeless. Whether you're a fan of vintage jewelry or simply love the look of this specific era, you'll find that these pieces work well in your jewelry wardrobe.